Whisk together eggs, melted butter, and coconut milk until combined. Set aside. In another mixing bowl, add in flour, baking powder, baking soda, salt and stir to combine. Graually add in flour and stir until just combined. Please do not overmix the batter. Some lump in the batter is normal. Set aside for about 20 minutes. Meanwhile, place Honey Comb cereal in a plastic bag, push the air out and seal. Use a rolling pin and lightly crushed them. They don't have to be fine. In fact you can leave them whole too if you prefer. Preheat your waffle iron. Stir in Honey Comb cereal into the batter just before baking. Spray with non-stick spray or brush with some melted butter. 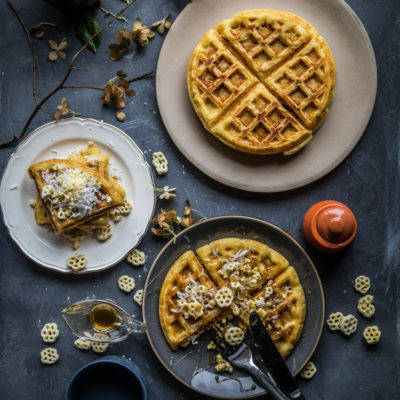 When the waffle iron is ready, fill the waffle iron with the batter and cook according to instruction on your waffle maker. The waffle should be crisp and golden brown. Remove and continue cooking until the batter is finished. Serve with sweetened coconut flakes, Honey Comb cereal and drizzle of maple syrup on top. Super NOM!